It was his strong defensive game that earned defenseman Brandon Carlo of the Tri-City Americans of the Western Hockey League an A rating from NHL Central Scouting in its latest players to watch list. But for Carlo to cement his status as one of the top prospects for the 2015 NHL Draft, he needs to advance the offensive side of his game. The numbers might not show it yet, but Carlo is putting the work in. In 23 games this season Carlo has one goal and 10 points, putting him ahead of his pace from last season, when he had three goals and 13 points in 71 games. "We're encouraging him to try to provide some offense," Tri-City coach Mike Williamson said. "He's such a great skater and he has a tendency to make sure his defensive game is in order, which is a good habit, good instincts. But he's got to push out of his shell a little bit and lean more toward the offensive side as well." At 6-foot-4 and 198 pounds, Carlo has the size and athleticism to eliminate the other team's offensive opportunities. Now it's just a matter of using that size, strength and skill set to help his team create offense. "I want to build upon my offensive aspect of my game this year," Carlo said. "That's something I can bring to my team and something we need." In addition to showcasing himself in Tri-City he also might have a chance to play on a grander stage. Carlo spent the first week of August at the USA Hockey National Junior Evaluation Camp in Lake Placid, N.Y., and was one of eight defensemen to remain at camp after an initial roster cutdown. He likely remains on the radar for USA Hockey for the 2015 IIHF World Junior Championship. There would be a bit of irony if USA Hockey adds Carlo to the WJC team, considering he grew up in Colorado Springs, Colo., the same city where USA Hockey is headquartered, and growing up he frequently skated at World Arena, USA Hockey's home rink. Carlo tried to earn a spot with the United States National Team Development Program but wasn't accepted. That's when he turned to Tri-City, which selected him in the 10th round (No. 214) of the 2011 WHL draft. "I explored all my options," Carlo said. 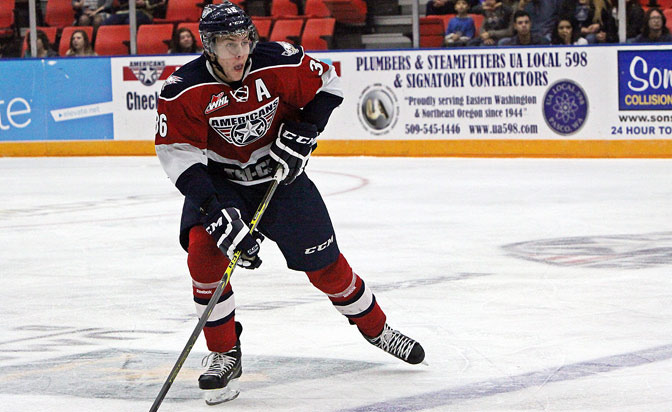 "... For me personally, with academics and things like that, I felt like the WHL was the right fit for me. Also I felt like it was the best option for me to give it my best shot at making it to the NHL." Moving nearly 1,200 miles northwest to Kennewick, Wash., at age 16 wasn't easy, but Carlo said his parents signed off on it -- to an extent. "My parents support me 100 percent," he said. "My mom was a little bitter when I left but other than that ..."
The move has paid off for Carlo and his NHL hopes. "He's a very intriguing guy," Central Scouting's John Williams said. "He's a really good skater and has great mobility for a player his size. Obviously the reach and range are there. He handles the puck well and is one of the best guys I've seen so far this year at being able to use the boards to pass off the boards to a teammate or get it out. He can beat the forecheck by bouncing it off the boards and onto the stick of someone. "He's a guy who I don't think he knows just how good he can be right now. He does get secondary power-play time and is a main penalty-kill guy. Another Tri-City guy on defense (2015 draft prospect Parker Wotherspoon) might be a better hockey player today, but I think at the age of 23 or 24, Carlo will have gone by him just because of his size and mobility and skill he has. A guy that size, you think Erik Johnson; Carlo has that body type." Johnson was selected by the St. Louis Blues with the first pick of the 2007 draft. Carlo won't go that high at the 2015 draft, but if he continues on his current path he won't be waiting too long to hear his name called at BB&T Center in June. "I had the honor of going to the  draft and experiencing it," Carlo said. "First round definitely is the show. So thinking about it I'd like to be in that range. I'm going to do everything I can to possibly be in there."